Alright it's time to make some Unicorns. 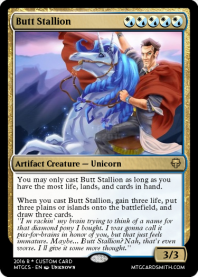 - Cards don't have to be unicorns but should at least relate to or support unicorns. - Unlimited entries but i'll only choose your best to judge. - Joke cards are allowed but try to keep them balanced and usable. HM/s (If any) - Fave that card. Here's some to get you going. Mother of booty souffle that's awesome. 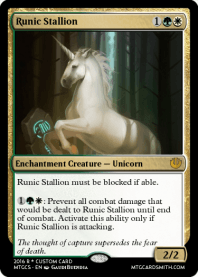 JOU was the only set in Theros block not to get a Unicorn. @Faiths_Guide - NOW I can sleep at night! I'd hoped for more contender but i'll judge soon if no one else enters. I will enter soon (when I get a good idea).